VIDES Philippines cordially invites you to experience a night of good music, good food, and great company. 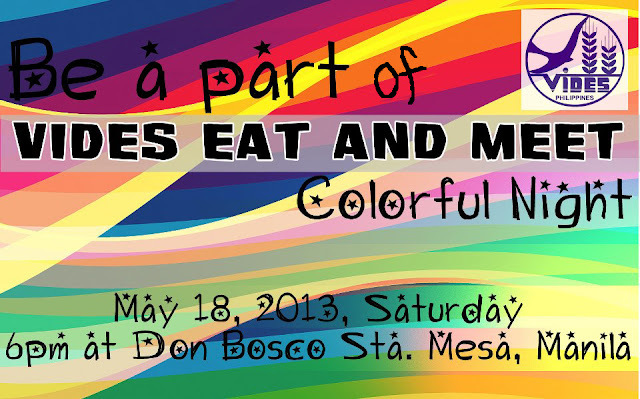 This year’s Eat and Meet Dinner for a Cause will be held on May 18, 2013 (Saturday),6:00 pm to 9:00 pm at Don Bosco School Manila,V. Mapa Extension, Sta. Mesa, Manila. Tickets are sold for only P500.00 each! Proceeds of the benefit dinner will be used to fund the 2013 VIDES Mission Camp which shall offer free basic medical services, grooming services, values formation and catechesis sessions, and a host of other fun, enriching activities to 500 indigent children and their families residing in Canlubang, Laguna. VIDES Philippines Volunteers Foundation, Inc. Please call (632) 715 6740 for more details.